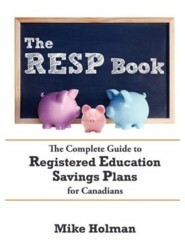 One of the main benefits of RESP accounts is the federal Canadian Educational Savings Grant (CESG). This grant is 20% of any eligible contributions in an RESP account. Let’s say you open an RESP account for your bouncing new baby and contribute $1,000 into the account. Your financial institution will send the account and contribution information to the Canadian government for grant approval. If the grant is approved, the institution receives the grant money and deposits it into your account. 20% of the $1,000 contribution is $200, so you will now have an extra $200 in the account courtesy of the Canadian government. This basically gives you an extra 20% one-time return on your contribution. Please note that additional RESP grants are available for lower income families – Check it out, the income thresholds are higher than you think. Quebec has additional RESP grants as well. $2,500 – Amount of annual grant-eligible contribution room accrued each year starting in 2007 or the year the child was born (whichever is later). The contribution room continues accruing up to and including the year when the child turns 17 years old. This amount is based on the calendar year and not the birth date. $2,000 – Amount of annual grant-eligible contribution room accrued each year starting from the year the child was born or 1998 (whichever is later) up to and including 2006. 20% – Amount of grant earned on an eligible contribution. For example: a $1,000 contribution would earn a grant of $200, if that contribution is eligible for a grant. There are additional grants available for lower income families. $500 – Maximum amount of grant a beneficiary is eligible to receive for each calendar year from the year they were born or 1998 (whichever is later) to the year they turn 17 years old. This amount was only $400 for years prior to 2007. A calendar year is from January 1st to December 31st. $7,200 – Lifetime grant limit per beneficiary. If you contribute $2,500 every year, you will hit the maximum grant level in the fifteenth year, and no more grants will be paid to the beneficiary. This limit includes additional grants available to lower income families. $50,000 – Lifetime contribution limit per beneficiary. Because there is no annual limit, you could potentially make one single contribution of $50,000 to an RESP if you choose. Contribution room carry over. One of the great things about the RESP is that you can carry over unused contribution room into future years. However, there is a catch: Only one previous year’s worth of contributions can be used each year. Contributions are not tax-deductible. You won’t get a tax slip, and you can’t deduct RESP contributions from your taxable income. For example: If you start an account for your six-year-old child, you can contribute $2,500 (this year’s contribution room) plus another $2,500 (from previously unused contribution room) for a total of $5,000, to receive a grant of $1,000. You are allowed to contribute more than $5,000 in this scenario, but there will be no grant paid on the amount above $5,000. When calculating contribution room carryover from past years, don’t forget that the contribution limit was only $2,000 prior to 2007. Let’s do some examples to clarify exactly how this works. Steve was born in 2010. His parents are broke, but one kindly grandmother decides to open an RESP account for him. She opened the account in 2010 and has $2,500 of contribution room available. She contributes $1,500 to the account in 2010, so the RESP grant is $300 (20% of $1,500). In 2011, she contributes $1,200, thereby qualifying for a $240 grant. Little Johnny was born in 2006. His parents decide in 2010 to set up an RESP account for him. They want to know how much money they can contribute each year to catch up on all the missed government grants. Let’s add up the current contribution room. In 2010, the couple has $2,500 of contribution room for the current year plus $9,500 of contribution room from previous years. Since the rule is that you can only contribute up to $2,500 of previously carried over contribution room each year in addition to the current contribution room, this means they can contribute this year’s amount ($2,500) and another $2,500 for a total of $5,000, which gives a grant of 20% or $1,000 for 2010. Since they only used $2,500 of their available $9,500 of carried over contribution room, they now have $7,000 in contribution room to carry over for the future. In 2011, they can contribute another $5,000 for a $1,000 grant. $4,500 of contribution room is carried forward to the next year. In 2012, they can contribute another $5,000 for a $1,000 grant. $2,000 of contribution room is carried forward to the next year. In 2013, they can contribute only $4,500. $2,500 from the current year plus $2,000 they carried over from the past. In 2014 and beyond, they can only contribute $2,500 each year and expect to receive the full grant of $500. Please note there are special RESP contribution rules for 15, 16 and 17-year-olds. If you have a family plan with two or more beneficiaries, you need to allocate each contribution between the beneficiaries. For example, you might want to set up all contributions to be divided equally between the account beneficiaries. Or you might have a particular contribution that should be allocated to just one beneficiary. You must set the allocation so the government can track the grants for each child. When you open an RESP account or add a new beneficiary to an existing account, you can set up the default allocation to split the contributions equally among the children on the account. If you want to make a contribution with a different allocation, you have to indicate this on the purchase order.